See the updates we've made to Falls Center. In 1899, Jewett Brothers and Jewett Wholesale Grocers built this four-story warehouse at the corner of Fifth and Phillips in downtown Sioux Falls. 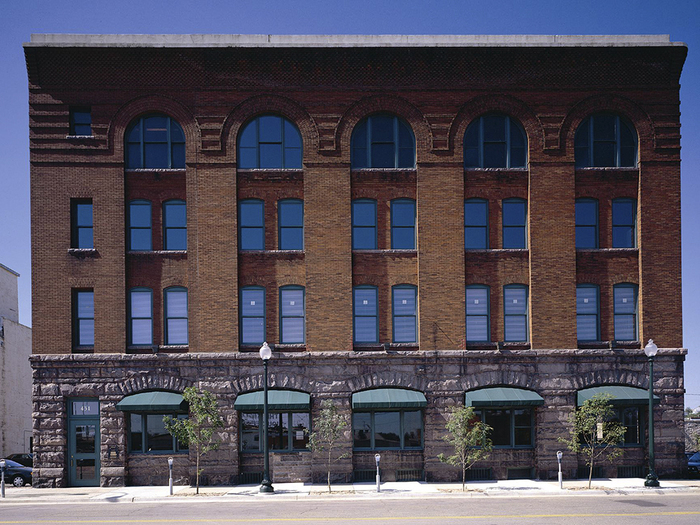 In 1992 the building was renovated and restored by Koch Hazard to accommodate a variety of office and retail space, including Koch Hazard Architect’s offices located on the second floor. The quartzite first story of the building acts as a base for the upper stories of brick. The parapet consists of highly detailed brick work in a checkered pattern corbelling out from the face of the building. This project is a 1994 AIA South Dakota Design Honor Award winner and a recipient of a Mayor’s Award for Historic Preservation.